FOR IMMEDIATE RELEASE – Santa Barbara, CA – May 8th, 2013. SBAOR represents approximately 1,200 Santa Barbara Realtors and Montecito Realtors from all real estate specialties including residential home sales, luxury mansions for sale, commercial sales, short sales, development, property management and appraisals. Every quarter, SBAOR ranks Realtors by the total dollar volume and number of listings for single-family homes and condominiums. “The real estate market continues to improve in Santa Barbara County. I’ve had several unique opportunities this quarter due to the recovering housing market, and I’m grateful to be recognized by SBAOR.” said Reaume. SBAOR Montecito realtors such as Barbara Reaume help home buyers and sellers navigate the complex real estate process by specializing in Santa Barbara relocation, luxury houses for sale, home buying tips, Montecito relocation, Montecito homes for sale, Santa Barbara homes for sale, Carpinteria real estate, house staging tips and short selling a home on a budget. 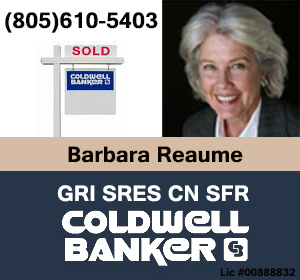 Barbara Reaume understands the drive to own a home; she draws from 30 years of experience as an established realtor. Home buyers looking for the best places to buy a home in Santa Barbara, consider speaking with a top 100 realtor from SBAOR. Selling your home without a realtor is time consuming and often leads to legal issues. 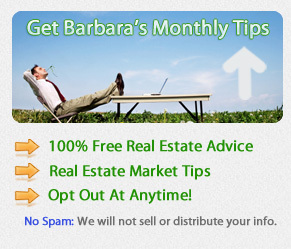 Barbara offers a free guide entitled “12 Smart Questions To Ask Your Realtor” at http://www.BarbaraReaume.com. Learn how to find a good real estate agent and how to sell your home fast in Santa Barbara County. Thank you for this valuable and helpful information! Through SBAOR’s recognition of Top 100 Santa Barbara Realtors and Montecito Realtors, the public will now be guided on whom to confidently entrust their property management.